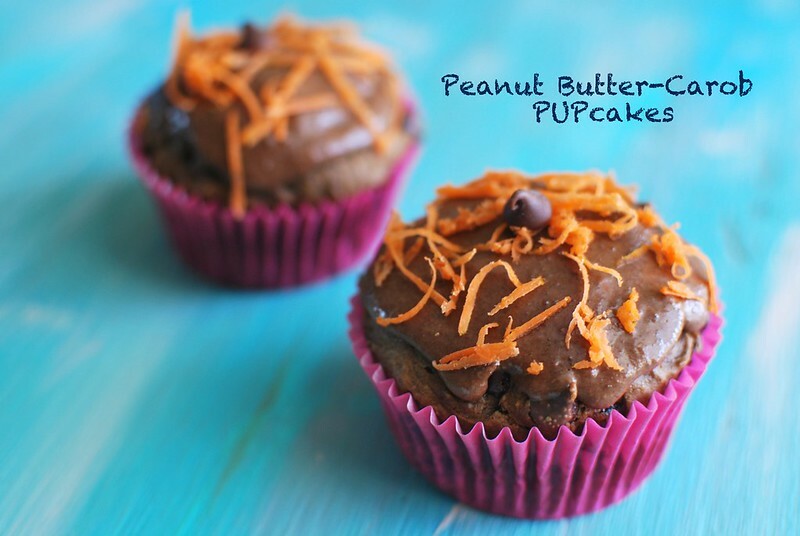 Bella’s Golden Birthday & Peanut Butter-Carob PUPcakes! My Bella turns 5 today! Woo Hoo! 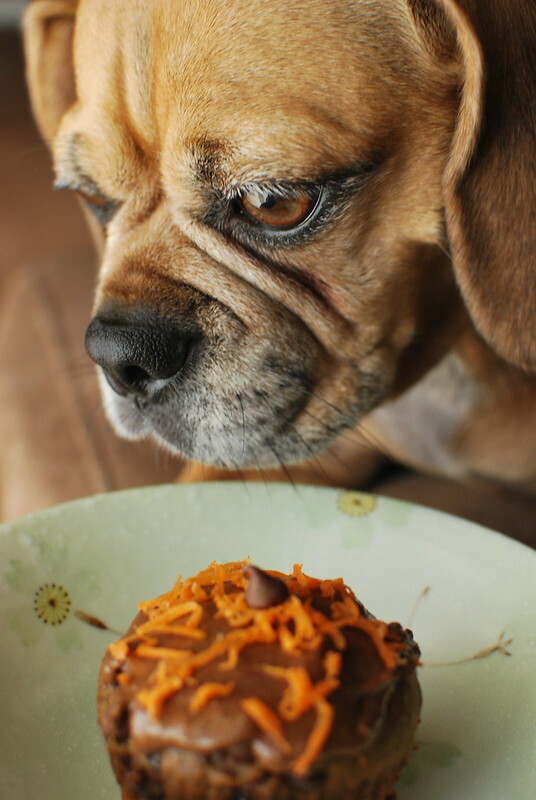 Yes, my little puggle can be quite mischievous and well–rather rascally. But at the end of the day she’s my super cuddly and loving little gal. Yup. She’s the Best Pup Ever. True Story. Since chocolate is a definite no-no for dogs, I opted for both melted and whole carob chips in the batter along with peanut butter, honey, shredded carrots, and jarred baby food. That’s right–baby food! Organic chicken to be exact. It may sound odd but it’s a hit with the pups. And lastly, I dipped the pupcakes into a carob “ganache” and topped them with carrot sprinkles. Needless to say, Bella loved them! Although I must admit that it was torture for her to wait until her mama finished snapping pics before she could dive into the pupcakes. She is much less concerned with documenting her Foodventures than I am but was such a good sport nonetheless. And with that….HAPPY BIRTHDAY BELLA! Love ya to pieces! Preheat oven to 350 degrees F. Place cupcake liners in a muffin pan. In a small bowl, combine ¼ cup carob chips and honey. Using 15 second intervals, microwave the chips and honey until melted and smooth. Be sure to stir every 15 seconds to avoid burning the carob. Set aside to cool slightly. In a mixing bowl, whisk together the flour and baking soda. In another bowl, whisk the egg, vegetable oil, baby food, peanut butter and melted carob until thoroughly combined. Stir in the dry ingredients and then the carrots and ¼ cup carob chips. Spoon the batter into the cupcake liners until they are about 2/3 filled. Bake the pupcakes for 18-20 minutes or until a toothpick inserted in the center comes out clean. Cool on racks. While the pupcakes are cooling, prepare the “ganache”. In a bowl, combine ½ cup carob chips, peanut butter and honey. Using 15 second intervals, microwave the items until melted and smooth. Check and stir every 15 seconds to avoid burning the “ganache”. Working with 1 pupcake at a time, carefully dip each cake top in the warm “ganache”, twisting your wrist as needed to ensure the pupcake top gets completely coated. Allow the “ganache” to set 1-2 minutes and decorate with shredded carrots and carob chips. Repeat with the remaining pupcakes. Pupcakes can be stored in the refrigerator for up to 3 days. Previous Post Lobstah, Lobstah…..Lobster Rolls! Great photos. 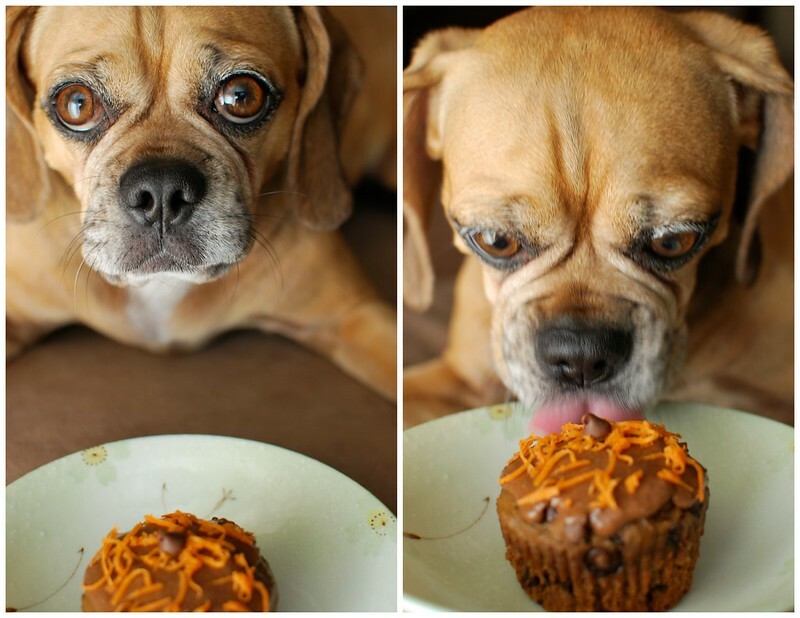 How you got her to pose and not jump in and eat the cupcake is amazing to me….Hope she enjoyed it! Happy bday Bella – Pugsley misses you!